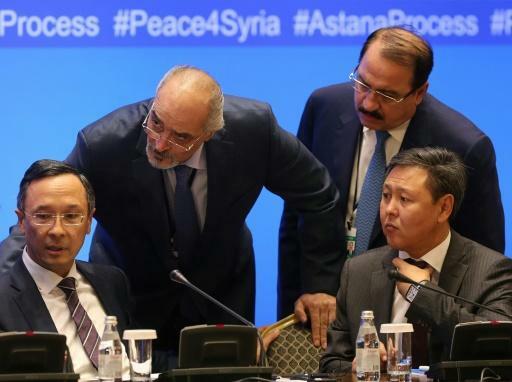 ASTANA (KAZAKHSTAN) - Key players in the Syrian war on Friday thrashed out more details of a Russian-led plan to ease six years of violence at the latest round of talks in Kazakhstan's capital Astana. Here is a quick look at who was there and what they discussed. The talks are co-sponsored by regime backers Russia and Iran and rebel supporter Turkey, but Moscow has been the key driving force for the meetings since they began in January. The negotiations hosted by Russia's Central Asian ally come after the Kremlin's military intervention turned the tide and helped leader Bashar al-Assad break rebel resistance in the key city of Aleppo. The diplomatic push brings together the Syrian government and representatives of the opposition, including some key armed groups who had previously steered clear of other negotiations. While the United Nations has got increasingly involved, the Astana process has seen Moscow, Ankara and Tehran largely sideline the West. The United States is limited to only sending an observer mission, as well as its regional ally Jordan. While the early rounds of the Astana negotiations failed to make much progress, recent meetings have enjoyed far more success. Russia, Iran and Turkey in May agreed a plan to set up four "de-escalation" zones to halt fighting in flashpoint territories held by moderate rebels. Since then Moscow has forged on with establishing the zones on the ground and deployed military police to patrol the boundaries of the three zones in the south, in Eastern Ghouta near Damascus and in the central Homs province. At the latest sixth round of talks that ended Friday, Moscow, Tehran and Ankara agreed that they would jointly police the fourth zone covering the contentious Idlib province on the border of Turkey. Idlib is the only province in Syria that remains entirely beyond regime control after having been captured in 2015 by an alliance of jihadists and rebels. Negotiations over who would patrol the zone had dragged on, with Turkey and Iran thought to be jostling to increase their influence. According to the Syrian Observatory for Human Rights, which monitors daily the death toll and the air strikes across Syria, the impact of the de-escalation zones has been significant. "Since the implementation of the de-escalation zones agreement in Syria, the death toll has fallen significantly and the air strikes have almost stopped," in the respective areas, Abdel Rahman, head of the observatory, told AFP. But Rahman said Damascus and Moscow "took advantage of the de-escalation zones to change the balance of power on the ground and have retaken double the territory they controlled before May." Jihadists such as the Islamic state (IS) group are not covered by the safe zones and the drop in fighting with moderate rebels has allowed Damascus and Russia to increasingly focus their firepower on them. Earlier this month Assad's forces scored their biggest success to date against IS when they broke a years-long siege in the eastern city of Deir Ezzor. The negotiations in Astana have done more to still the violence that has killed over 330,000 people in the past six years than any previous diplomatic push. While the talks have been focused on fighting on the ground they have not dealt with the major political obstacles blocking the path to any final peace deal in Syria. Those issues are still mainly being handled by the United Nations at parallel talks in Geneva, but progress there has been negligible. It remains to be seen if any advances in Astana can eventually be translated into concrete progress on the political front. Key players in the Syrian war on Friday thrashed out more details of a Russian-led plan to ease six years of violence at the latest round of talks in Kazakhstan's capital Astana.